There are 4 types of tissue: muscle, nervous, epithelial and connective tissue. These 4 types of tissue make up every structure in our body. Connective tissue is the most pervasive, and has three basic ingredients. These are collagen, elastin, and ground substance. Collagen fibers are the longest molecules ever found. If one were as thick as a pen, it would be a yard long. Collagen is a protein consisting of three polypeptide chains that line up to form white fibrils They are stronger than steel and can hold ten thousand times their own weight. Collagen fibers give tissues their tensile strength, resiliency and structural integrity. Elastin fibers are much like rubber bands. Elastin fibers allow the tissue to stretch, thereby helping to absorb shock. 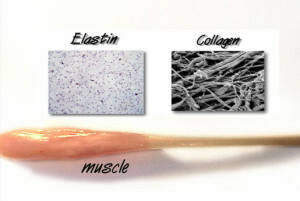 Fascia, tendons and ligaments contain both collagen and elastin fibers. Ground substance is a viscous, transparent fluid, like raw egg whites. It surrounds all the cells in the body, and is part of our internal ocean. Chemically the ground substance is a mucopolysaccharide. Its main components are hyaluronic acid and proteoglycans. Hyaluronic acid is viscous and lubricates the collagen, elastin, and muscle fibers, allowing them to slide over each other. Proteoglycans form the gel of the ground substance. This gel is excellent at dispersing shock and holding tissues in place. One of the most amazing properties of the ground substance is its ability to go from a jelly-like state to a completely liquid state. This is called thixotropy. Just like Jell-O- when its cool, it’s a jelly, and when its warm, it’s a liquid. In areas of injury or little use- or in old age, the ground substance in fascia is less of a liquid, and becomes a harder gel. Unfortunately, if the ground substance become too hard it begins to restrict motion and dry up. In bodywork the mechanical stretch, body heat and bio-electric energy all contribute to taking the ground substance from a gel to a liquid. In its liquid state it allows movement, stretch and for the exchange of nutrients and cellular wastes to occur more efficiently. Fascia is a type of connective tissue. Fascial sheaths surround and penetrate almost every structure in our bodies. Fascial sheaths surround individual nerve fibers, and also bundle those fibers into larger trunks. Loose fascial networks hold our adipose tissue in place as it pads and protects other structures. Fascia also surrounds arteries and veins as well as interleaving itself through every muscle. There are three layers of fascia in every muscle, the endomysium, the perimysium and the epimysium. These three layers of fascia within the muscle merge at the ends of the muscle to form a tendon. Still the same components- ground substance, collagen and elastin, but now the fibers arrange themselves in parallel to be able to transmit the pull of the muscle without breaking. This fascial network does not stop there. Not only does this tendon embed itself into the bone, it also fans out, surrounding the entire bone- literally becoming the periosteum of the bone. Then from the periostium to anther tendon, into another muscle to another tendon surrounding another bone and so on until the fascia in your toes has connected through this network to the fascia in your head and fingertips- uniting your body in one continuos fascial network. Add to that all the other tissues- nerves, arteries, veins, fat and organs all suspended and penetrated by this fascial network- it’s no wonder it’s called connective tissue. Ground substance, by its very nature, is designed to resist force. The gelatinous nature of the ground substance and the rubber-like elastin fibers will effectively disperse shock that comes through the body. For this reason, quick strokes have no effect on the fascia. Quick strokes indeed will create heat in the area, but only engage the elastic barrier of the fascia. In a few moments it returns to its original length. If our goal is to lengthen the fascia at the level of the collagen matrix, we must apply a different type of manipulation than Swedish massage. Studies have shown the initial 90 seconds of stretch only effect the elastin fibers. During this initial stage we are feeling the elastic barrier release. Once the elastin fibers have reached their full length, only then do the collagen fibers begin to unwind. Not only does it take time to engage the collagen , it also takes time for the ground substance to go from a gel to a liquid. In its gel state, it holds the collagen fibers in place, but in a liquid state, the collagen fibers can begin to lengthen. As this lengthening occurs, cross-linkages within the fascia begin to break. As the cross-linkages break, the strain pattern in the fascial sheet will change. If the therapist is sensitive to this strain pattern, they can follow the body and change the direction of their stroke as they hold. This is called unwinding. This takes patience, sensitivity and skill. By quieting the mind and bringing awareness into their hands, the therapist can follow the body’s unwinding. Myofascial release is a gentle technique. Since collagen is made to resist force, the most effective way to release the fascia is gentle sustained pressure. In fact too much pressure will decrease the practitioner’s sensitivity, and the body may resist the work. Usually only a few ounces of force is enough to start the fascia moving. Sometimes practitioners who have studied a bodywork style that uses more force have a hard time trusting that the lighter pressures are effective. RULE 1: Stretch for 2-5 minutes. Performing these techniques for a shorter duration will only stretch the elastin component, providing temporary or no results. RULE 2: Maintain a continuous stretch. As soon as you let up, the elastin fibers bring the tissue back. It will take another 90 seconds to engage the collagen. RULE 3: Use light pressure. Collagen fibers have a tensile strength of 2000 lbs per square inch. They are designed to resist force. Yet they lengthen under gentle, sustained pressure. RULE 4: Flow with the tissue. As the tissue unwinds, the direction of force changes, follow the unwinding to be most effective.